During my two brief stints as a singleton and cooking for one this January, I fully embraced the grain bowl as a way of eating healthily and economically when on my own. I discovered the delights of farro (which is still a bit of an unexplored grain with me) but my fallback when I’m on my own, or feeling poorly, is always brown rice. I’m a complete paleo and low-grain diet skeptic: the thought of a life on a low-grain diet truly depresses me. As the wholegrain guru, Maria Speck, argues brilliantly in this article here, the no-grain diet isn’t natural, or particularly good for us or, more importantly, environmentally sustainable. 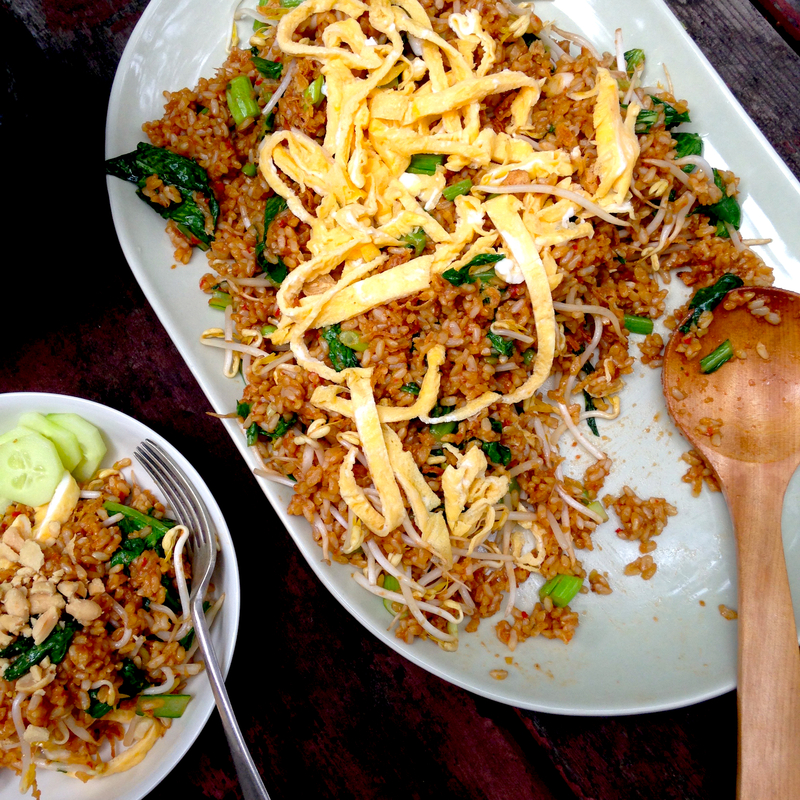 This nasi goreng with Asian greens is a lovely celebration of a rice bowl meal. There are times when I prefer white rice (particularly with dahl and other pulses) but fried rice is one of those meals where brown rice comes into its own. Fried white rice feels a bit too insubstantial and airy-fairy to make a meal on its own, but fried brown rice has enough gravitas and heft to make it a stand-alone meal. 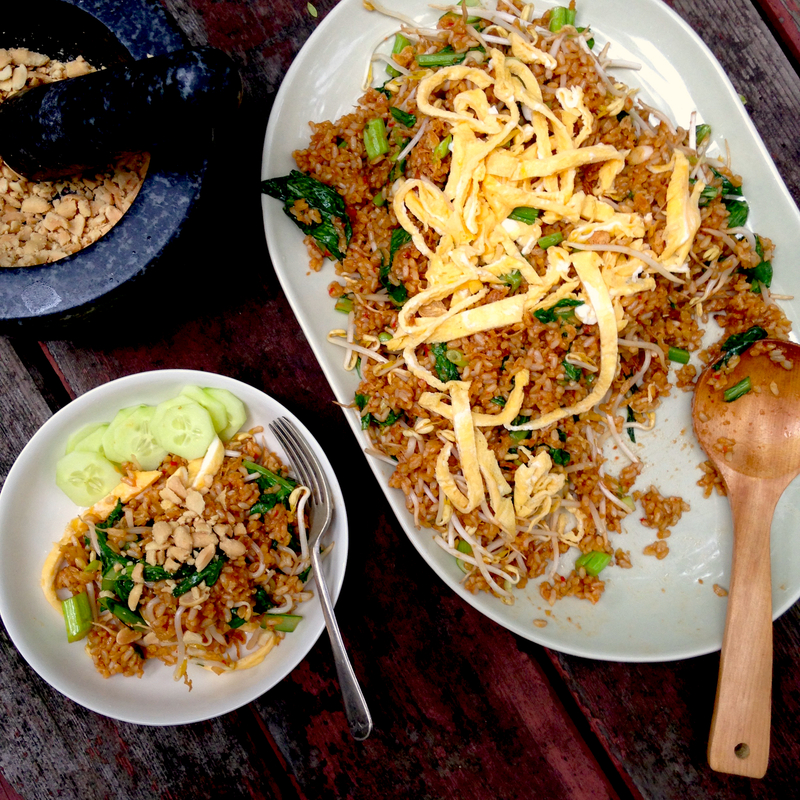 I often make a simple stir-fried rice meal when I’m on my own, but this brown rice version of nasi goreng from Hetty McKinnon turns the humble fried rice into a spectacular dinner party worthy meal. Hetty McKinnon’s cookbook Community has become one of my favourite cookbooks – her recipes always have some special touch that makes them uniquely inspiring and with this nasi goreng, it’s a simple spice paste, combined with a sweet and spicy dressing of kecap manis, soy sauce and tomato puree. This makes a wonderfully satisfying meal on its own but is also a great festive side dish for a party. ¼ cup of roasted peanuts, crushed. Make spice paste by blending all ingredients in a food processor, until smooth. For omelette strips: beat eggs and season with salt and pepper. Heat a light coating of oil in a small no-stick frying pan. Pour enough egg in pan to lightly coat the pan and cook on low heat, until omelette set. Flip omelette and cook for a few seconds more and cooked on both sides. Repeat until all the egg is used up. Allow omelettes to cool and cut into thin strips. Mix kecap manis, soy sauce and tomato puree together. Heat a wok or large stir fry pan until smoking hot. Add spice paste and stir fry for two minutes, or until paste smells fragrant. Add rice, tomato puree, kecap manis and soy sauce mix, and stir fry for a few minutes until rice is heated through and everything is well mixed. Add greens and stir fry another couple of minutes until greens are just cooked. Remove pan from heat and toss through bean sprouts and sliced spring onions. Serve with sliced omelette, cucumber, crispy fried shallots and crushed peanuts. This is like the hippy version of Nasi Goreng – it’s really good though.